How are you guys? I have been busy for while in many things, I have just finished RTOS course, let us begin with simple thing which is What is RTOS? 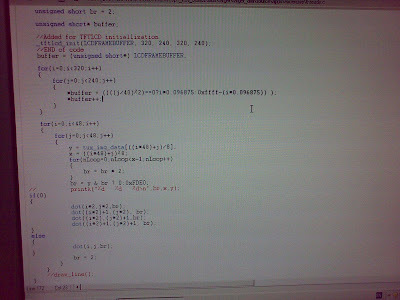 simply it is Real Time Operating System, the course was all about concepts and main ideas behind it, What I understand from this course is that it is all about time, time is most critical issue in the Real Time Operating System, Also Multitasking is very important issue, anyways I will write more detailed post about it, here is some photos taken from the lab. This is the development kit that we use. My application was XBM reader, the XBM format is Array of image information, I have got this image form the internet, the other part of the application was gradient effect in the back ground, it is in lines each line wide is 40 pixel, it toggle lines, one start with Whites end with orange, and the other one starts with black ends with dark blue. 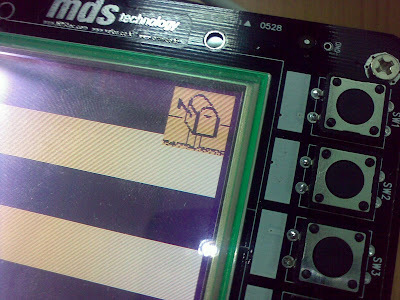 here is the code of the drawing function, this function is very effective because it has direct access to LCD memory. The nice thing about this thing is it is very fast, the OS starts in less than one second, also drawing was very fast because of the nature of the device, the device work by memory, which means, if you want to run anything you get to its memory location and start what ever you want, it is WIDE OPEN, waiting for whatever you want.